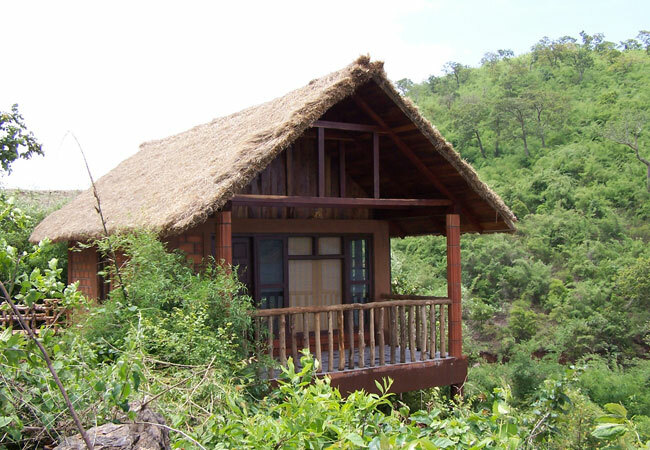 Indeed the River Tern Lodge is a canvass of natural beauty forming a perfect blend with rich wildlife. The lodge derives its name from the flocking of thousands of River Terns during the breeding season on a nearby island. The sight of congregation of so many elegant River Terns offers a brilliant view to a beholder. Apart from the blissful sight of the River Terns carrying on with their interesting antics, the surrounding natural view is also equally mesmerizing. The breath taking view of River Bhadra is enhanced by the natural sounds of the numerous birds cackling together and the soft waves of the river lashing against the shore. The exotic wildlife at Bhadra Wildlife Sanctuary adds to the rich natural pleasures of the place. The serene atmosphere of this resort near Chikmagalur is the perfect backdrop for anyone wishing to have a rejuvenating time in the lap of nature. The River Tern Lodge welcomes its visitors to a comfortable stay that comes complete with all modern amenities and necessary services. The Lodge has five beautiful cottages and five splendid log cabins, each equipped with spacious twin beds. The accommodations are designed to offer tranquility and privacy to the visitors. Every room of the resort has a veranda that overlooks the placid waters of the Bhadra Reservoir and provides the visitors with a stunning view of the sunset over the backwaters. The rooms of the resort are not equipped with TV in order to offer the visitors maximum opportunity to enjoy and appreciate nature in its purest form. An interesting facility of the resort is the dining space. It is a beautiful, circular, open-to-sides gazebo called Gol Ghar which offers the visitors an amazing experience of enjoying food in a beautiful atmosphere. The food provided is a delectable spread of North Indian and South Indian dishes. Both vegetarian and non-vegetarian dishes are served at Gol Ghar in a buffet style. The resort features amazing wildlife documentaries to keep the visitors enthralled in the evenings. The resort also provides every kind of water activity equipment for the visitors. Highly trained and experienced instructors are present at the Lodge to guide the visitors in their water activities while adhering to strict safety guidelines. Located in the Chikmagalur district of Karnataka, the resort can be accessed with private vehicles or cabs on rent. To reach the River Tern Lodge from Bangalore, drive towards Tumkur and follow the Shimoga bye-pass road at Tumkur. After passing through Gubbi, Tiptur, Arsikere, Kadur, Birur and Tarikere take the left that has a Kuvempu University direction board as a mark. After travelling for another 14 km and reaching Lakkavalli, a sign board of the River Tern Lodge comes into view. The resort is about 4 km from this point. The Range Forest Office at Lakkavalli also helps visitors in offering directions towards the resort. The River Tern Lodge offers various activities to rejuvenate the mind and the body. Visitors are treated to enthralling jeep rides into the Bhadra Tiger Reserve Wildlife Sanctuary, situated at a distance of 4 km from the resort. Various wild animals and numerous species of birds engage the attention of the visitors inside the wildlife sanctuary. This resort near Chikmagalur also arranges visits to the Tyverekoppa Lion and Tiger Safari. Visitors can also visit and enjoy the Sakkrebyle Elephant camp. The resort conducts water adventure sports such as sailing, kayaking, water cycle, water trampoline, joy fishing, etc. The River Tern Lodge offers comfortable stay at affordable prices. The rates vary according to the type of occupancy selected for stay. The rates are different for Indians and foreigners. A child below 5 years and accompanying the parents is not charged for accommodation. A child aged between 6 to 12 years and accompanied by parents, is charged just 50% of the adult tariff.